In the 19th century families in crisis had to depend on charity and sometimes had to beg for money. 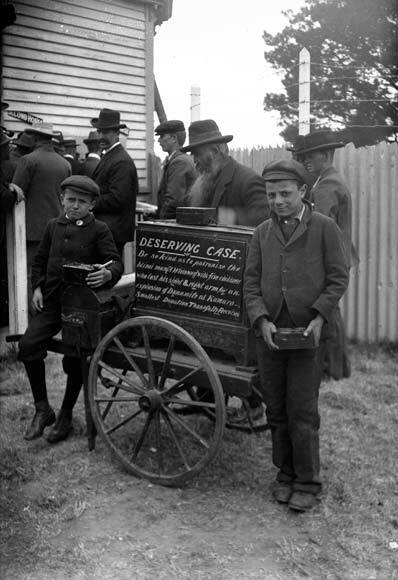 Jack and Rudolf Lousich were photographed in Kumara, on the West Coast, collecting donations for their widowed father, Louis Lousich, who had been blinded and disabled in a mine explosion in 1884. At that time there was no accident compensation for workers and no invalid or unemployment benefits. Lousich is presented as 'deserving' – a worker, robbed of his job, with five children to support. During the 20th century the New Zealand state increasingly provided financial support for families in similar circumstances.